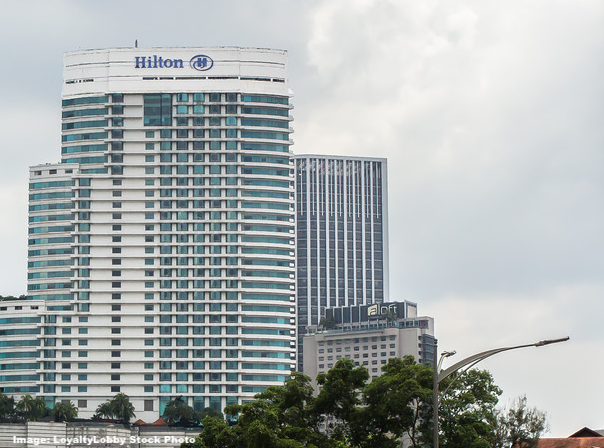 Earlier this week an accident occurred at the Hilton Hotel in Kuala Lumpur, Malaysia when the entire ceiling of the hotel lobby collapsed causing at least one injury. 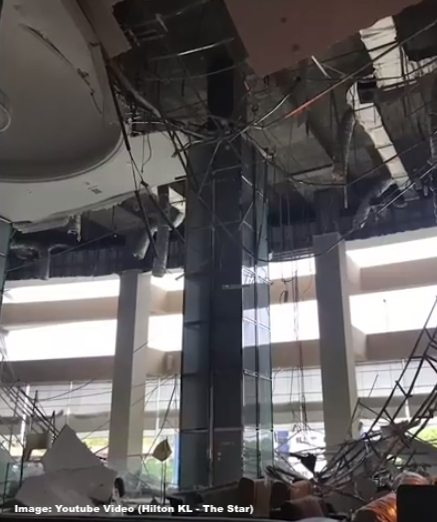 A construction worker suffered a 14 meter drop to the floor resulting in head injuries while the remainder of the ceiling fell pretty much on top of everything inside the lobby and even cars outside the main entrance. Coincidentally I’m staying in KL this week and went by to have a look but at this point not much can be seen anymore. According to lounge staff it was pretty messy! Malaysia newspaper The Star (access here) wrote that the incident occurred during the night. In the 3.40am incident on Sunday (Oct 14), an area of plastered ceiling totalling 1,500sq undergoing repair works for electrical wiring, collapsed. A Bangladeshi worker fell about 40 feet and suffered head injuries. However, as of 7.30pm, the entire section of the lobby was discreetly closed off with large white sheets. There were still loud sounds of construction work coming from behind the sheets. The Fire and Rescue Department sent 26 fire and rescue personnel from three fire stations to the scene, following a distress call. The damages were substantial yet the Hilton kept their operations running the entire week, however the lobby facilities including ORO Cafe were closed for obvious reasons. Here is a short Youtube video from The Star showing some of the damage. Despite the injuries the man suffered he was thankfully ok and admitted to a local hospital after that steep drop which could have resulted in much worse. 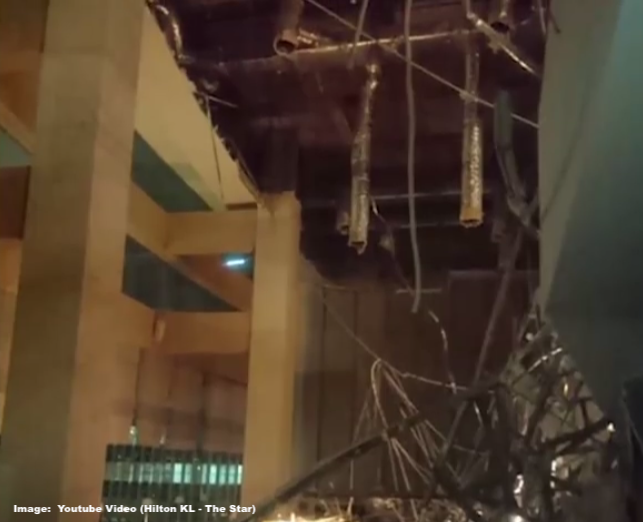 From what can be seen in the video and images the entire ceiling ripped/peeled off as one piece and that even extended to the outside car park area. The insurance company will have some paperwork to do in order to get all this taken care of. Due to this taking place in the middle of the night there were no guests in the lobby. I’ve stayed at this hotel many times and it’s a very busy and popular property that is always packed with people. A few hours later and this wouldn’t have been a pretty scene that’s for sure.